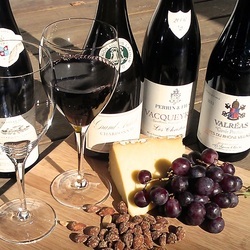 All wine-lovers will want to schedule at least a day of visiting vineyards, meeting the producers and, of course, tasting the wine..... You can wander through the villages, or tour the 'caves' of the most famous Cotes du Rhone appellations: Chateauneuf du Pape, Gigondas, Cotes du Ventoux, Hermitage.... It will be difficult to go back without a case or two. To make a wonderful day into a very special one indeed, enjoy a long, lazy lunch on the tree-shaded terrace of Les Florets near the village of Gigondas. (They have a Michelin star for good reason...) Closer to home, only 15 minutes away, you'll find Louis Latour's Coteaux de l'Ardeche. Taste their fine chardonnay, more unusual viognier, or rather special 'Grand Ardeche'. In the tasting salon you'll find other high quality local produce to buy, such as honey, pate and roasted chestnuts. 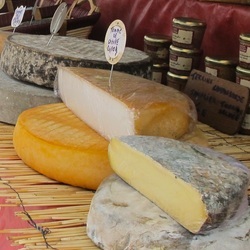 Every day of the week there is a town or village nearby holding a market where you'll find an amazing variety of food producers selling every local speciality from truffles to goats cheese, olives to honey, peaches to chestnuts, tomatoes to lavender... In the larger markets, artisans and craftsmen sell provencal linens and pottery, jewellery, carved wood and ornaments. Check the listings for days and places - be early though, they are usually packing up for lunch by midday! Made with ingredients from the local region - in particular almonds and lavender honey - this traditional confectionary is best tasted fresh, straight from the producer. You can watch it being made on a tour of a small 'artisanal' factory or a large commercial one. We enjoyed the tour at the traditional Diane de Poytiers, but there are many factories eager to show you round! 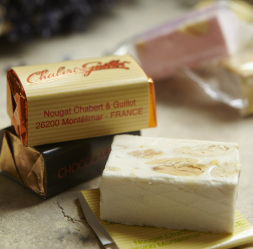 Montelimar hosted its first nougat festival in July 2012 along the picturesque boulevard 'alles provencales'.